Your wood burning stove or multi fuel stove, with the proper care, should last you a lifetime and make a fantastic centre piece to any home. wood burning stoves are fairly easy to maintain but it will need some TLC over the years to keep them functional and looking their best. All our wood burning stoves can run on a variety of different fuels, that is why they are also referred to as multifuel stoves but this does not mean that you can just burn anything on them. Unsurprisingly, they burn dry wood very effectively and can also run on coal and a wide range of eco fuels. Wet wood, straw and manmade, combustible products should be avoided as these can significantly shorten the lifespan of wood burning stoves and flue systems and can cause chimney fires in extreme cases. When your wood burning stove arrives, it is very tempting to light a big fire and sit back and enjoy your new stove but you should be gentle with your new stove and start with small fires. 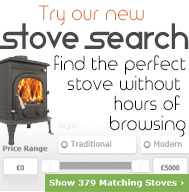 Wood burning stoves burn at very high temperatures and all the components of your stove need to bed in. Start by lighting smaller fires and gradually increase to a large roaring fire, that way wood burning stoves last a lot longer. Wood burning stoves will need cleaning but they do not need to be spotless. Allow a bed of ash to build up on the grate as this can enhance efficiency of wood burning stoves and only periodically clean and change this bed of ash. Your stove glass will need regular cleaning, even with an airwash system to help keep it clear. Your stove’s door glass will become cloudy over time. To maintain that crystal clear view of you fire, you can purchase some stove door glass cleaner, which will restore your stove’s glass time after time. You should regularly clean the air intakes of your woodburner as these are used to control the fire and to help keep the stove glass clean. Your stove’s air intakes can become clogged over time, so regularly check that they are operational and clean all the vents to ensure they are not blocked. This is something that is easy to put off but it is very important. Clogged flues and chimneys can decrease the draw of your flue system and can cause chimney fires. Whether you have a twin walled flue system, a single walled flue pipe into an existing chimney or if you are using flexible chimney liner for wood burning stoves, you must still sweep your flue system. With a clogged chimney not only is the risk of fire increased but your stove won’t operate as efficiently. In severe cases, the waste gases might not be vented properly and can start filling your room with deadly CO gases. For this reason – always have a working CO alarm in the room with you and regularly sweep your chimney. You can purchase a CO alarm here and it could save your life. You should sweep your chimney at least once a year. See our list of chimney sweeps in your area. If you have a sealed flue pipe system your flue can be swept through your stove or for ease of access you can purchase a stove pipe with access doors. Over time the seals around your stove door and glass will start to perish and you will notice that your fires become uncontrollable. You can easily replace these seals with stove rope. You just need to measure the diameter of the existing rope and purchase some more of that size. You will also need some stove rope adhesive to fix it in place. First, remove the old stove rope by a mixture of pulling and even gentle chiselling with a flat headed screw driver – just be careful not to damage the stove. Then make sure the area is as clean as possible, you can use water but don’t used detergents, as this can react with the rope adhesive. Then simply apply some rope adhesive to the area and feed in your new stove rope. You should now have a good seal once more and a fully working wood burning stove. Over time cast iron wood burning stoves can start to look a little faded and worn. This might be ideal for some tastes but the good news for those who want a snappier looking stove is that they can be restored to their formed glory very easily. Grate polish on its own can be very effective to bringing your stove back to black or for the more seriously faded stove, try some stove paint, which is easily sprayed onto the stove. If you are feeling creative you could also try painting your stove a different colour. I am interested in buying a Dover wood burning fire. How much would it cost to have it delivered and fitted to my house in pinoso, it is a single story house….